This article is about the soundtrack CD compilation of the first three Donkey Kong Country games. For the trilogy of games themselves, see Donkey Kong Country (series). 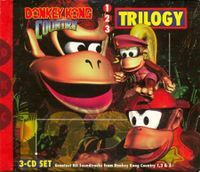 Donkey Kong Country Trilogy is a 3 CD set of music compositions from Donkey Kong Country, Donkey Kong Country 2: Diddy's Kong Quest, and Donkey Kong Country 3: Dixie Kong's Double Trouble! Donkey Kong Country Trilogy was released on November 1, 1996. It has a total of 143 tracks and plays for a total of three hours. In each CD there are multiple blank tracks after all of the music has been played. All tracks were mostly composed by David Wise, with assistance of Eveline Fischer and Robin Beanland. Tracks 24 through 48 are all listed as [blank track] with a duration of 00:04 each. Tracks 30-34 are listed as [blank track] with a duration of 00:07 each. Tracks 35-55 are identified as [unlisted track] with varying lengths for each. In CD 1, the track name "Fear Factory" may be a reference to the industrial band of the same name. In CD 3, the track name "Baddies on Parade" may be a play on "Bulls on Parade", a famous song by the band Rage Against the Machine. This page was last edited on February 11, 2019, at 01:37.